Broadwood Stadium was certainly no intimidation despite its cavernous echo. 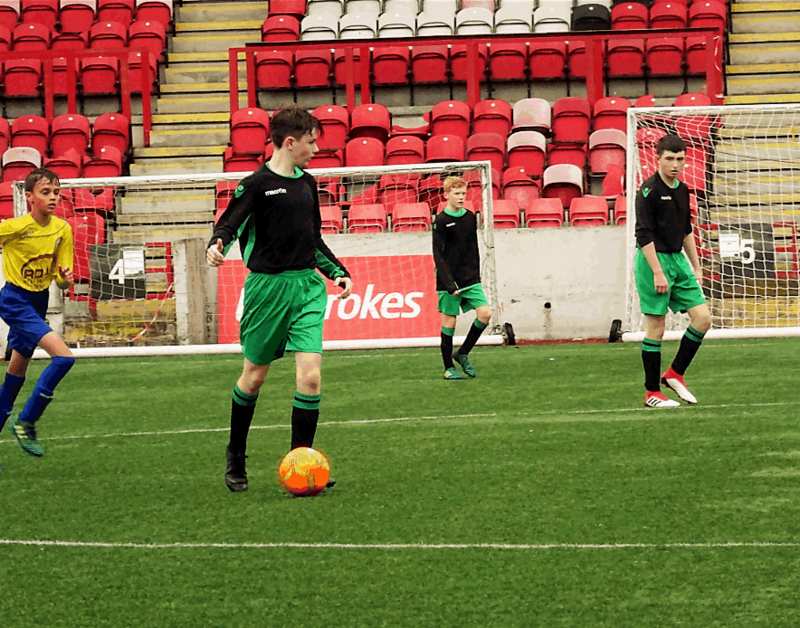 The boys took to the pitch confident and to some extent excited to be performing in a proper stadium. Up in the stands the scattered support looked forward to an entertaining game. The rain could not dampen their enthusiasm. The Colts were up against it from kick-off. An interchange of passes had gained us a few yards into their half. The ball then broke off to Beau who tried his luck from just over the half way line. His effort flew in the air, bounced in front of the keeper who misjudged it and into the net. But Cumbernauld would recover quickly from the early setback and for the next twenty minutes put up a fierce defensive display. They dug in, re-organised by putting plenty of bodies behind the ball. Our offensive play was frustrated by the brilliance of the Colts’ keeper who excelled himself as a shot stopper. Our movement and passing in our patient build up slowly drew the opposition out while daring raids into our half were promptly snuffed out by the athletic pairing of Beau and Reilly. 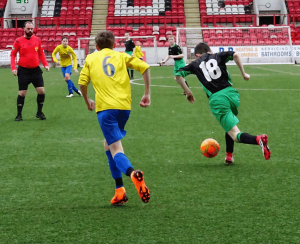 We finally broke through Colts resolute defence when Euan worked himself into a shooting position but his shot on goal was parried into Dom’s path to finish from close range. We added to our advantage a few minutes later when Mairtin, from the right wing moved the ball inside to Reilly. The centre back took a touch then struck a fierce shot from distance. He may have thought he had gone for a shoot-and-hope, but it was a quality effort that got the keeper well beaten. 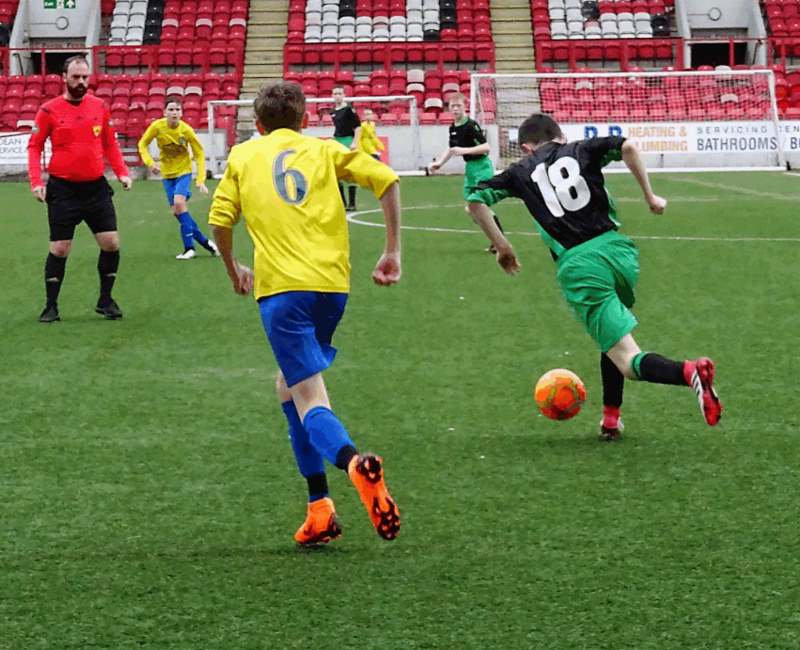 Cumbernauld Colts managed to keep the score respectable until half time. At the restart we pushed for more goals. We won a corner in the first minute and Gallagher delivered a great ball into the box. The keeper parried Dom’s header but the ball fell kindly to Dylan who finished into the roof. 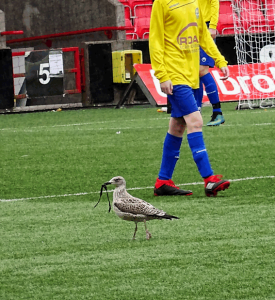 Cumbernauld Colts were pegged in their own half hardly able to break out. Ricky’s persistent pressing was rewarded when he won the ball back, rounded the defender to the right and then drilled his shot from a tight angle into the far corner. The goals kept on coming. Dylan put Gallagher through to score. Dylan was again pulling the strings as he put Ricky through for his second off a defender. An industrious Dylan was a thorn in Cumbernauld’s side. He drove through on goal but the keeper parried his effort and Dom was there to mop up again to finish with aplomb and record a second hat-trick in as many games. 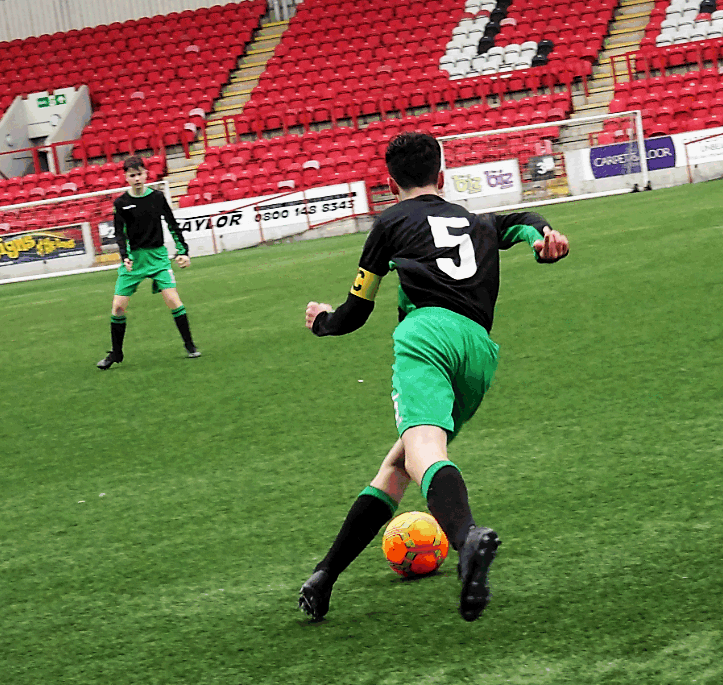 Ricky joined Dom with a hat-trick of his own with a delightful chip from a parried Dylan shot. Today’s game was well controlled and managed. When patience was required the boys assumed their roles and it was satisfying to see them apply techniques and play patterns learned from training. 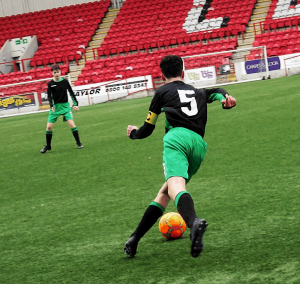 A well worked free kick showed initiative and teamwork, but most of all it demonstrated the boys’ maturity in problem solving by themselves and offering viable solutions to the challenges they face. In the meantime, our keepers played their part by efficiently dealing with every challenge thrown their way. No Replies to "Cumbernauld Colts Vs St. Patrick’s – 2004"